Walking is an incredibly underrated form of exercise. It’s a great cardiovascular workout which can be light or made more difficult if you increase incline or pace. On rest days, take it steady. You don’t need to set out of the house with the intention of doing a walking workout, just go somewhere fun! You could go into your local town or city and do some window shopping. You could take in some scenery in the woods or at the beach, or you could take a stroll to meet a friend that lives within walking distance. You’ll rack up steps without thinking about it while giving your body the rest it needs. Just make sure you have supportive, comfortable shoes on and get yourself out and about! Not only is swimming a lot of fun, but it’s incredibly low impact. As the water supports your body, there’s no strain at all on your joints making it the perfect rest day or recovery exercise! Swimming uses every muscle in your body, is a great cardiovascular workout without being too intense (if you take it easy), and shapes and sculpts the body. If you’re used to sweating it out in the gym, it’s a little different and genuinely enjoyable. You could do some laps, look for an aqua aerobics group or even just search ‘swimming classes near me’ if you’re a total beginner. If you live near a beach or a body of water that’s safe to swim in, you could save cash and go and have a swim there instead! Cycling is a great way to get active. With the ability to tailor the ride for the super fit to beginners, cycling is for anyone...who can ride a bike. On your rest day, go with a nice, flat, and even route. Even if you're usually happy to tackle big hills and crank up the gears, keep it easy on your rest days. It will still work your heart and lungs, not to mention your legs, arms, back and core. There’s lots of information on cycle routes online, and if you use an app like Komoot you can program in a route, and it will tell you how easy or challenging it will be. The most underrated of all exercises, stretching helps release muscle tension. On your rest days, shoot for static stretches or yoga poses. You should feel a slight pull while in the stretch, holding the position for 20-90 seconds. Repeat the stretch as needed until the tension in your muscles is minimised. I also like to do a few, simple yoga stretches. This allows me the option to scan my body and see what it needs. From there, I can address any tension or soreness, giving my body the attention it needs. What is your favourite rest day activity? Be sure to join the discussion down below. Yup, I do a lot of walking. I do it whenever I can. I'll park far away so I can walk more. I also jog daily in my neighborhood. I love to walk - I find it very relaxing! It helps clear my mind also. I think it is a great way to stay fit, as well as a good rest day activity. Very true advice and that I apply regularly. When one can not go to the gym, for various reasons, he can still find the way to keep fit in everyday life. Oh no this just reminded me that I was supposed to start working out today. I also said that yesterday but hopefully I will fulfil it. I do agree with these list. My favorite are walking and swimming. It really helps me relax. These are some wonderful ideas, it is amazing the difference just stretching makes and hands up I love swimming. I love swimming. And I try to swim as much as I can! There are all great activities! My favorite rest day activity is sleeping. Haha. I don’t mind walking. I can’t do a whole lot because of a neuromuscular disorder. This is really great, I love being always active, always moving. Walking works for me, it is great. My favourites from this list are stretching and swimming. These two always do the trick for me. I love cycling! it is always so much fun and feel good! Going on walks is so relaxing too! Great tips. And a these are so simple to do! I walk daily. I might as well start cycling too. It's really fun. My favorite rest day activity is swimming. I head to the gym pool and put on my headphones and dance in the water. I cycle on a daily basis so it is not a rest day activity to me. But on my rest day walking is surely an alternative to stay active! Dancing as well can be a fun one! What is a rest day and how do I qualify for one? :) I think if I got one, I wouldn't do many things that required activity. Ha! 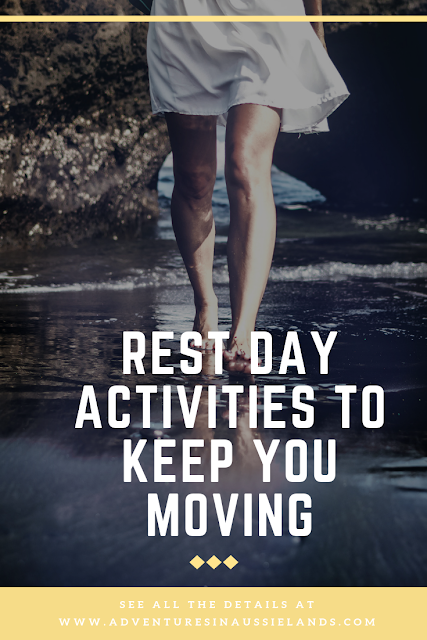 Your rest days sound like my active days! I guess I need to get into better shape! I love all these tips to stay active. Cycling is my favorite. Going on walks is so relaxing too! Walking indeed is the best experience! Helps me burn calories. I agree walking is an underrated form of exercise. I have gotten great results with a 45 minute daily walk. Even on a rest day I dont get rest. Doctor has written me for bed rest however these activities r really great esp walking.